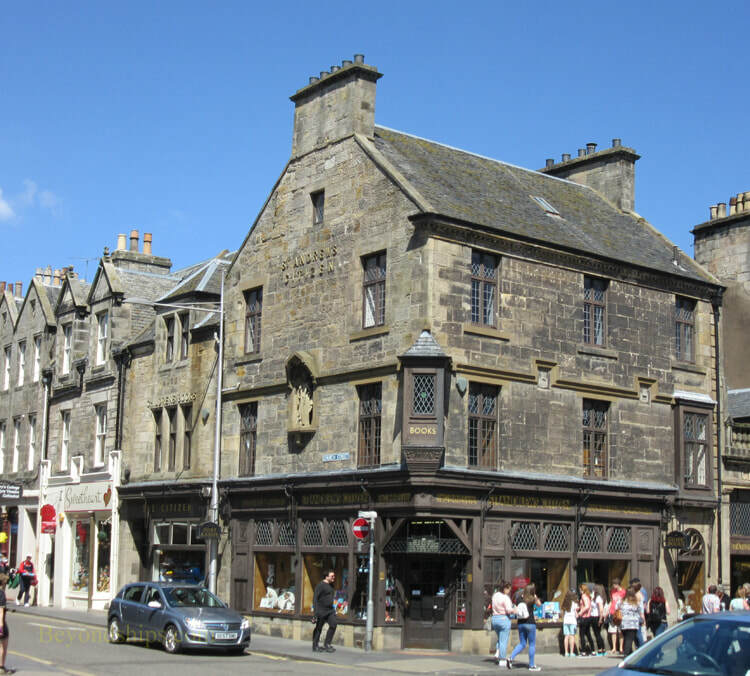 St. Andrews is a town in Fife, Scotland, some 30 miles northeast of Edinburgh. It was once one of the most important cities in Scotland. As a result, the town has numerous historic buildings. It is also a young town, home of Scotland's first university. And the name St Andrews is spoken with reverence by all lovers of the game of golf. Above: Holy Trinity Church where in 1559 religious reformer John Knox gave such a fiery speech that the congregation attacked the nearby Cathderal of St. Andrews. 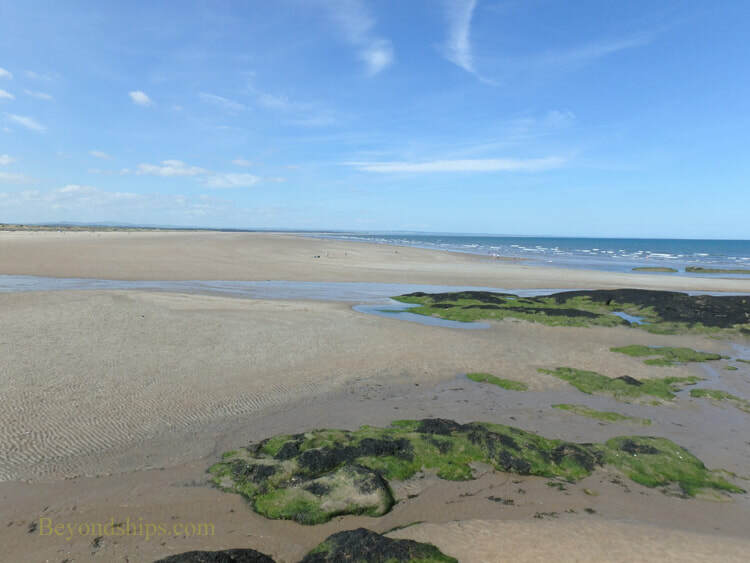 Left: The West Sands along St. Andrews' seafront. It was used as the setting for the opening scene of the movie "Chariots of Fire." In 2012, the British Olympic Team re-created the scene. In the 8th century, St. Rule brought to Scotland from Greece what was believed to be the relics of the Apostle St. Andrew. The place that he brought them was the place where the town of St. Andrews now stands. Work began on a cathedral to replace the priority that housed the relics in 1158 and continued for more than a century. Finally, the cathedral was dedicated in 1318. The cathedral was the largest church ever built in Scotland. Indeed, it remained the largest building ever constructed in Scotland for 600 years. St. Andrews became the ecclesiastical center of Scotland. It was a place of pilgrimage and the thousands of pilgrims that came each year from across Europe brought economic prosperity to the town. All of this changed during the Protestant reformation. In the 15th century, the Catholic mass was outlawed and by 1561, the cathedral had been abandoned. Over the following centuries, portions of the cathedral collapsed and the ruins served as a source of building materials for other sites. Today, the ruins of the cathedral are open to the public. Admission to the grass-covered grounds is free. 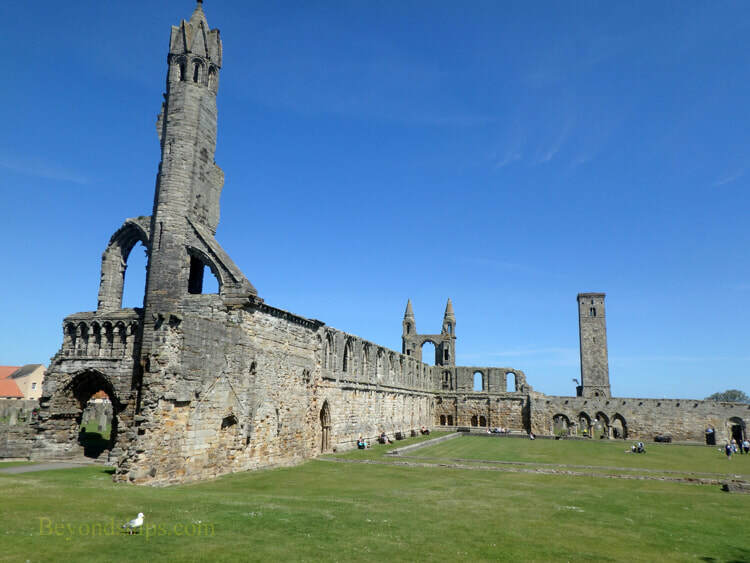 However, tickets must be purchased to visit the Cathedral Museum and St. Rule's Tower, which was part of the priory that existed here before the cathedral. 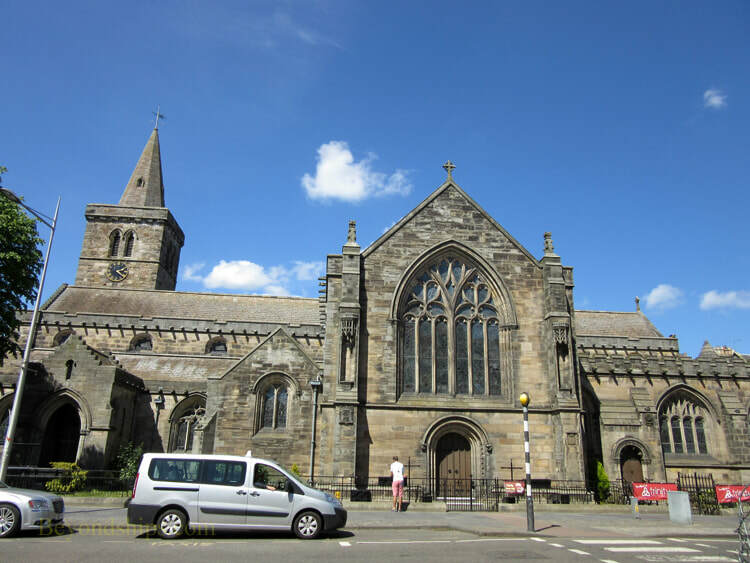 For information on visiting St. Andrew's Cathedral, see the Historic Scotland website. Right: St. Rule's Tower provides panoramic views over St. Andrews. ​Above and below: The ruins of the Cathedral. 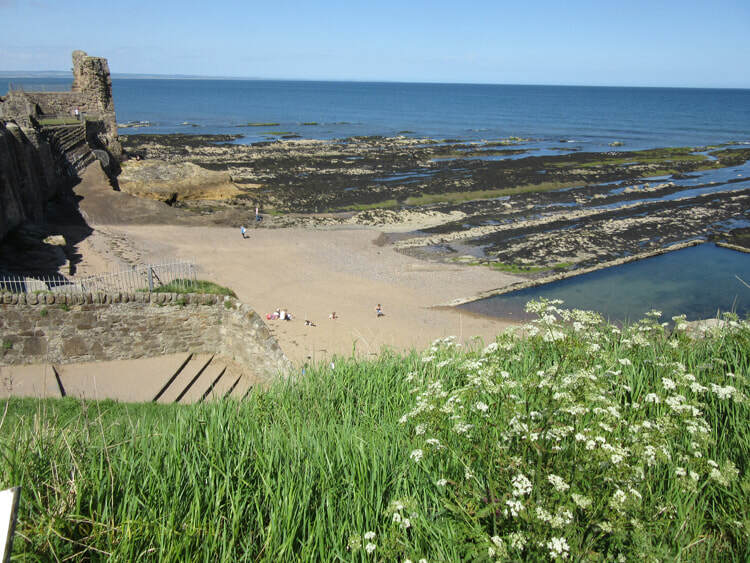 St. Andrews Castle was built as a fortified residence for the local bishop in 1200. 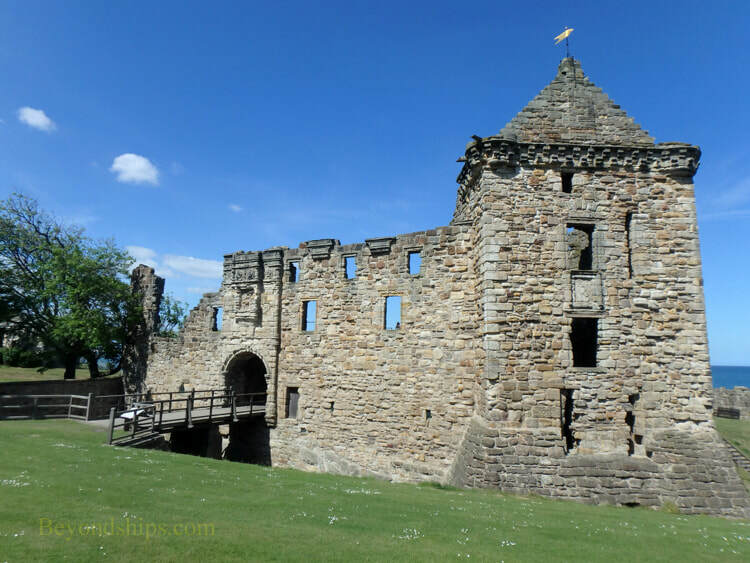 It remained the bishop's palace during the time that St. Andrews was an ecclesiastical center. 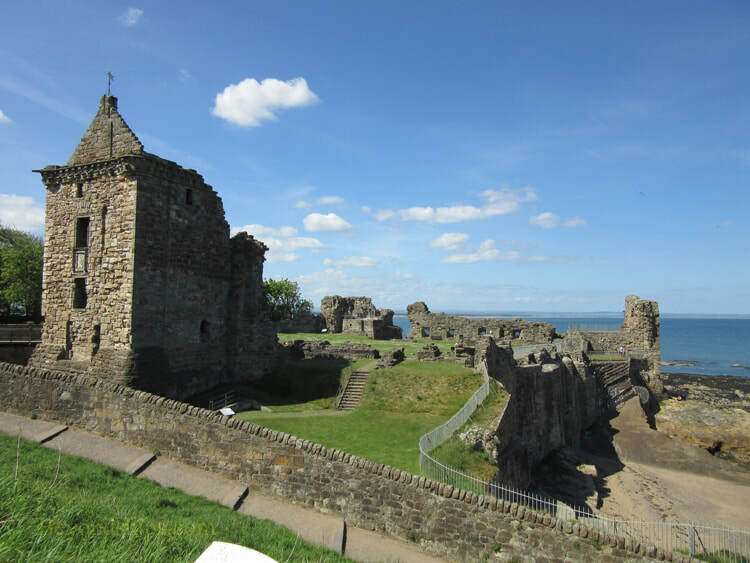 As a fortified building, the castle was strategically important during the Wars of Scottish Independence in the 14th century. It changed hands several times between the Scots and the English. In 1337, it was destroyed by the Scots in order to prevent it from falling into the hands of the English again. The castle was re-built by Bishop Walter Trail in 1400. The unpopular King James III of Scotland is believed to have been born at the Castle of St. Andrews in 1452. What remains of the castle today is largely from this period. During the Protestant Reformation, the castle served as a center for religious persecution. Protestants were imprisoned in its infamous Bottle Dungeon. However, a group of Protestants overcame the garrison and hung the bishop from a window in the castle. Catholic forces then besieged the castle. Among other things the attackers excavated a mine under the castle. The defenders successfully counter-mined. Nonetheless, the castle fell when modern artillery was deployed by the attackers including placing cannon in the towers of the cathedral. Over the next century, the castle fell into disuse. 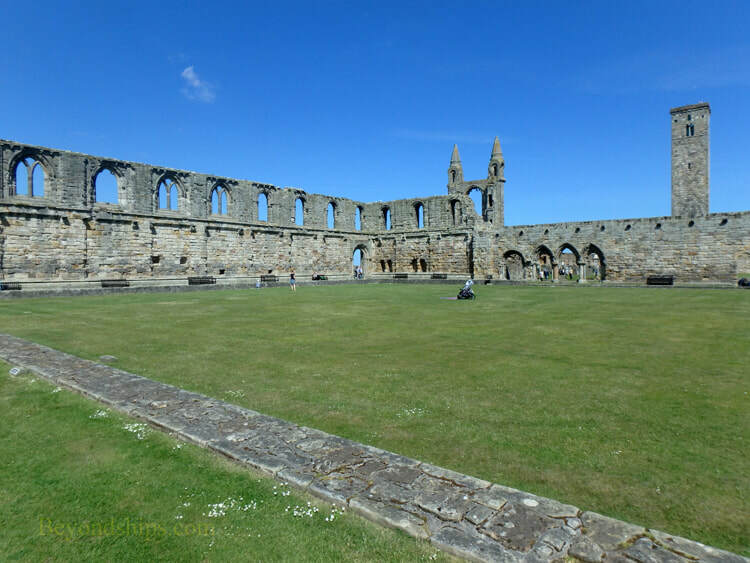 St. Andrews was no longer an ecclesiastical center and so there was no need for a bishop's palace. By 1656, it was serving as a mine for building materials. Today, the castle is a ruin. However, sections still remain including portions of the south wall, a tower, the Bottle Dungeon and the mine and counter-mine from the siege. Above: The entrance to the Castle. ​Below: The Castle is on a promontory overlooking the sea.